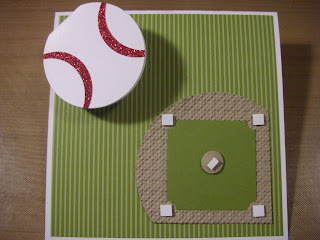 Inking It Up With Cathy: Hit a Home Run with this Card! I CASE'd this card from Scott Nielson, CFO at Stampin' Up! because I thought it was so cute! He used it as a way to tell us that we had "hit it out of the ballpark" on last year's recruiting challenge. I had a recent hostess who requested a child's birthday card and thought this would be perfect for a little boy. The baseball even opens up to a "Happy Birthday" wish and sits up on a spiral of wire. Such a fun card!! !